Italian Bomba a Mano Mod. 35, O.T.O. The O.T.O. is the simplest of the three Mod.35 Types. 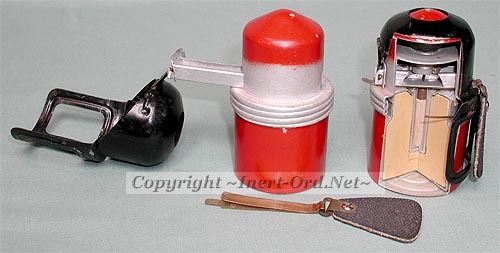 The Allways fuze is driven by a lead ball held between a cone shaped cap and a spring loaded striker. An interesting feature is the design on the ball, it's a lead-wrapped assembly of small lead shot, intended to rupture at the moment of detonation. At first I though this was for secondary fragmentation effect, but it turns out this was a safety feature. Since the grenade was an offensive type, designers didn't want to have a heavy part of the bomb flying far away from the intended point of detonation, an possibly injuring the thrower. That's the reason why the ball should break into tiny parts at the moment of detonation. The British had this kind of problem with their offensive type bomb No. 69. The heavy steel ball accounted for many injuries among the throwers. 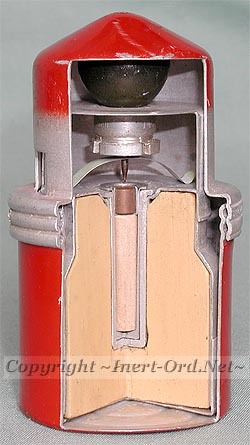 The internal capsule contains the explosive and a primer/detonator tube. A thin wire ring locks the two body halves together at a specific place, fixing the overall length, so as not to bind the internal parts. To use, the pull tab with the attached safety strip is withdrawn, just prior to throwing, unlocking the safety lever. When thrown the lever was to catch the air and be pulled from the grenade, removing the safety bar from between the firing pin and the primer. 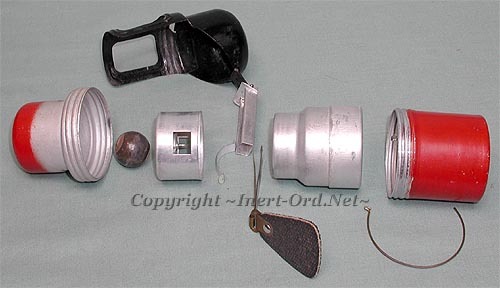 This was an open terrain grenade, as some amount of time and distance was required to allow the mechanism to function properly, which it had a tendency not to do. Here is the OTO as configured prior to impact. Once the safety bar has departed, the firing pin is held away from the primer by a simple leaf spring. The components inside are free to move. o Impact Bottom First - Momentum presses the lead ball downward on the striker. o Impact Top First - The HE capsule will be driven up into the striker. o Impact from any side - The ball will be pushed to the side and forced downward by the sloped wall of the top cap, forcing the striker into the primer. This fuze functions in "all ways", hence the name. The advantage of the Mod.35 OTO design is simplicity, but the arming sequence is rather "stiff". The open construction and close fitting surfaces seem an invitation to jamming from any sort of foreign material such as sand or mud. Of the three Mod.35 types, the OTO appears to have been the most dangerous grenade (sensitive) if encountered in an unexploded condition. While the Allways fuze concept is simple, providing an adequate safety mechanism which also arms in a reliable manner has historically been a very elusive goal.